The Ibanez 2018 AZ2204 Prestige Electric Guitar in Ice Blue Metallic is a masterful instrument, made in Japan by craftsman who have gone to great lengths to produce the highest quality of instrument at the most affordable price. Equipped with professional-grade hardware, highly responsive electronics, and finished to the highest of standards, the Ibanez 2018 AZ2204 Prestige is perfect for players of all levels. The guitar is supplied with a hardshell case, which gets your guitar to any gig in safety and style. The body adheres to a deep double-cutaway body profile, which affords ready access to the highest of frets. The slender body depth pairs well with the contoured body shape to establish a snug feel against your body as you play. The bevelled edge of the lower bout creates a comfortable resting position for your picking arm, guaranteeing unimpeded access as you sail through licks and riffs. The AZ2204 is built using alder, a lightweight and tonally balanced tonewood that is favoured by many due to its comfortable playability and tonal versatility. The body is finished in a cool ice blue metallic paint job, which is paired with a white pickguard to create an aesthetic that is easy on the eyes. 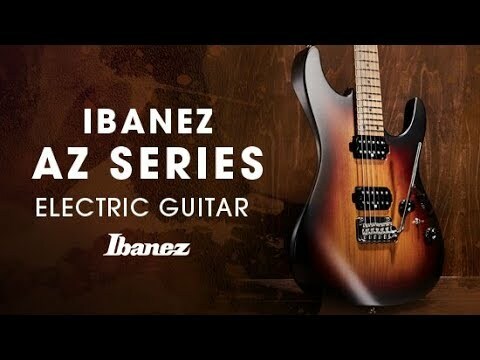 The Ibanez 2018 AZ2204 is equipped with a trio of Seymour Duncan Hyperion pickups, with a pair of single-coils in the neck and middle positions, and a humbucker in the bridge. The range of tones that can be pulled from this setup is truly remarkable, giving you the power to chop and change seamlessly between any musical style. Control comes in the form of master volume and tone controls, as well as the dyna-MIX9 switching system with alter switch. The body of the Ibanez 2018 AZ2204 Prestige is equipped with a Gotoh T1802 tremolo bridge, which provides accurate tremolo control whilst optimising intonation and sustain. The headstock is home to Gotoh MAGNUM LOCK machine heads with H.A.P. to uphold tuning integrity with absolute precision throughout the most demanding of performances. As we've come to expect from an Ibanez Prestige series model, the AZ2204 is perfect for discerning professionals who demand nothing but the best.